JAXA | Tropical Rainfall Measuring Mission "TRMM"
Utilizing Space Through Satellites Tropical Rainfall Measuring Mission "TRMM"
About Tropical Rainfall Measuring Mission "TRMM"
TRMM is an Earth-observation satellite that diagnoses conditions on Earth by measuring precipitation in tropical and subtropical areas. Needless to say, rainfall is related to the daily weather. It serves not only as a "gift from heaven" that provides water, which is essential to the survival of all the living creatures, but also as the cause of natural disasters such as floods and sediment disasters. Clearly, rainfall is deeply involved in our daily life in various ways. Recently, attention in many countries has focused on the importance of maintaining water resources. To that end, the observation of rainfall is extremely important. 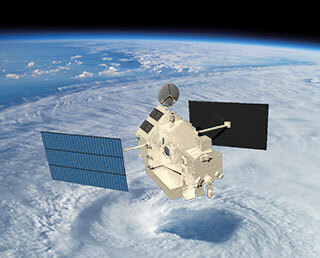 The Tropical Rainfall Measuring Mission (TRMM) aims to make a global measurement of rainfall. When moisture in the air changes into rain, heat is emitted into the atmosphere. As this heat is the driving force for the circulation of the atmosphere, information on global precipitation is essential to explain and forecast that circulation. Since tropical and sub-tropical rainfall comprises more than two-thirds of global rainfall, it has a significant influence on the circulation of the atmosphere. There is, however, a serious lack of data on precipitation in tropical and subtropical regions, because there are not enough land-based observation points in those regions. To get this information, we have to make our observations from space. The information obtained in this way is needed to forecast tomorrow's weather, but that's not all. It is also important basic data for the analysis of changes in the global climate, and for more precise forecasting of future changes. For example, this data will not only enable us to predict what the weather will be like three months from now; it will also help us forecast how the El Nino phenomenon will affect global climate change and cause abnormal weather conditions every few years, and how global warming will develop in ten, or even one hundred years. Symposium of 10-Year Anniversary of Tropical Rainfall Measuring Mission (TRMM) "Rain in a Changing Earth"
Characteristics of Tropical Rainfall Measuring Mission "TRMM"
The TRMM satellite, a joint project between Japan and the United States, was launched on November 28, 1997 from the Tanegashima Space Center (TNSC) by the H-II F6 launch vehicle. Japan provided the launcher and developed the Precipitation Radar (PR), while NASA developed the spacecraft and four additional observation instruments, and operated the satellite after its launch. Unprecedented data obtained by the on-board Japanese radar attracted increased attention and expectations, and brought us new information on rainfall. The TRMM satellite re-entered the atmosphere at 12:55 p.m. on June 16, 2015 (Japan Standard Time) over the South Indian Ocean after far exceeding its design life of three years and two months and continuing observations for 17 years to contribute to research on the study of precipitation.